The Berrien County Sheriff’s Department is investigating a two vehicle head-on crash in Bainbridge Township Wednesday that left one of the drivers trapped in their vehicle. The department tells us it happened just before 5:30 p.m at Napier Avenue and Arent Road. The driver of a Nissan Sentra crossed the center line and struck a GMC Sierra pick-up. 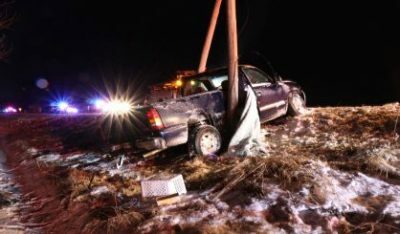 The pick-up then left the road and hit a utility pole, breaking the pole in half. The driver of the Nissan Sentra had to be freed from their vehicle by first responders and was then taken to Lakeland Hospital. The driver of the pick-up was also taken there. Police believe alcohol was a factor, and the names have not yet been released. American Electric Power was brought in to replace the utility pole. The crash caused traffic in the area to be re-routed for several hours.